Police in haz-mat suits surrounded a building at Garden City's Adelphi University for some six hours Tuesday after a mysterious powder was found inside. The brown and orange, gritty material was discovered along the threshold of a room on the second floor of Alumnae Hall, which houses Adelphi's nursing program. 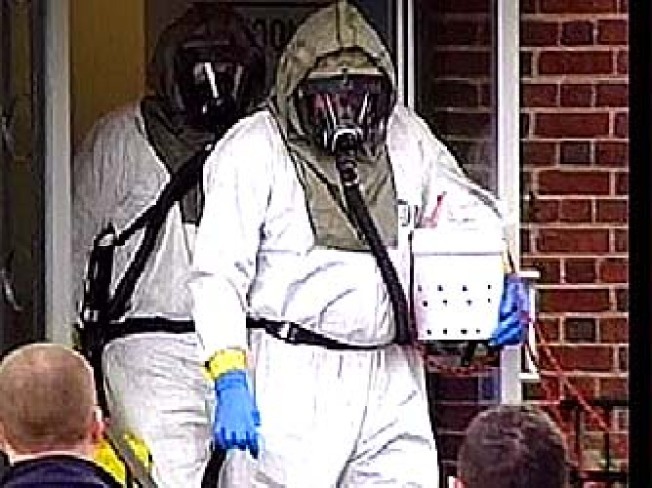 More than 100 students, professors and administrators were then quarantined in another part of the building, as investigators tried to identify the powder. "It looked like Tang," said administrator Jodi DiGennaro, referring to the 1960's drink mix. "Everyone remained calm," DiGennaro added. "But it was still a little nerve wracking when someone orders you to evacuate an area." By late afternoon, preliminary tests determined the material was some kind of foot powder, according to Nassau county police. Whether it was left in the building as a prank has yet to be determined. "It was stressful," said student Ashley Allen, whose class couldn't escape a test despite the scare. "The teacher said if we don't like our grade we can retake it." The rest of Adelphi University remained open throughout the investigation.